One Day Nusa Penida tour package consists of West Nusa Penida Tour, East Nusa Penida Tour, and Special package Nusa Penida Tour. West Nusa Penida Tour and East Nusa Penida Tour will focus on the Island Tour, and Special Package Nusa Penida Tour will combine West Nusa Penida Tour and 3 snorkeling points. Nusa Penida is a small and untouched island next to Bali that has some of the most incredible landscapes and the most beautiful place in Bali. It's always amazing to see some new places and Nusa Penida will fascinate you to stay longer. Hands down, some of the most incredible scenes you will witness. One Day Nusa Penida Tour becomes the best option for your holiday to visit Penida Island. This Nusa Penida Tour Package will bring you to visit the unique and new places such as Kelingking Beach, Broken Beach, Angel Billabong, and Crystal Bay. How to book Nusa Penida Tour? West Nusa Penida Tour is one day tour to visit the western Nusa Penida. The West Nusa Penida Tour will visit the most interesting place such as Angel's Billabong, Broken Beach, Kelingking Beach, and Crystal Bay. This is sharing/group tour subject to minimum booking 2 people & valid until 31 March 2020. Pick up and drop off from Seminyak, Sanur, Kuta, Jimbaran, Nusa Dua. 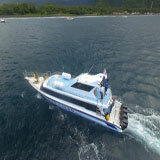 Return ticket fast boat Sanur - Nusa Penida. 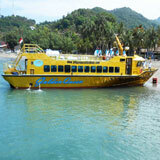 Nusa Penida Island tour at Kelingking Beach, Broken Beach, Angels Billabong and Crystal Bay. What to bring on Nusa Penida Tour? Extra money for soft drinks. 06:30 am our driver will pick you up from the hotel and drive you to the meeting point in Sanur to get the fast boat to Nusa Penida. 07:30 am upon arrival at Sanur harbor complete the registration and relax for a while. 08:15 am depart from Sanur to Nusa Penida approximately 45 minutes. 09:00 am arrive at Nusa Penida harbor, start West Nusa Penida Tour by visiting Angel's Billabong the natural infinity pool. After that, we will take you to Broken Beach (Pasih Uug ) is an arched tunnel in the cliffs, allowing the ocean to flow into a pool. A comfortable place to take a picture and sometimes you can see Manta ray fish swimming over the sea. 01:00 pm our team member will take you to a restaurant and serve a lunch, then relax for a moment. 01:45 pm we will drive you to Kelingking Beach it is a beautiful view of the cliffs and charming beaches from the cliff top. Continue the Nusa Penida Tour go to Crystal Bay that has crystal clear water and very good visibility for snorkeling or for diving trips. 04:15 pm after the tour is completed, we will take you back to the boat and transfer back to Bali again. 06:00 pm you will arrive back at your hotel. The Special Nusa Penida Tour Package is one of one day tour package to Nusa Penida which combine West Nusa Penida Tour with three points snorkeling. The island tour will visit Angel's Billabong, Broken Beach, Kelingking Beach, and Crystal Bay Beach. While the snorkeling will be done at 3 points such as Wall Bay, GT Point, and Gamat Bay/Crystal Bay. 06:30 am pick up from the hotel and drive to Sanur harbor. 07:30 am arrive in Sanur complete registration and get a boarding pass. 08:15 am leave Sanur to cross Nusa Penida for about 45 minutes. 09:00 am arrive at Nusa Penida harbor, we will take you to do snorkeling at 3 points and every point will spend 30 - 45 minutes. 11:30 am our team member will take you to Crystal Bay beach for relaxing. Continue to visit Kelingking Beach. 01:00 pm we will take you to have lunch. 01:45 pm we will drive you to Angel's Billabong infinity pool and take you to last destination Broken Beach. 04:15 pm after the tour is finished, we will go back to the boat and transfer to Bali again. 06:00 pm we will drop you back to the hotel. This is sharing/group tour subject to minimum booking 2 people & valid until 31 March 2019. 3x snorkeling at Wall Bay, GT Point, and Gamat Bay/Crystal Bay. Nusa Penida Island Tour include Kelingking Beach, Broken Beach, Angels Billabong and Crystal Bay. The East Nusa Penida Tour will give opportunity to visit or enjoy the most beautiful places in the eastern part of Nusa Penida. This one day trip will visit Goa Giri Putri, Teletubbies Hill, Atuh Beach, and Raja Lima. Nusa Penida Island Tour include Goa Giri Putri, Teletubbies Hill, Atuh Beach, and Raja Lima. 09:00 am arrive at Nusa Penida harbor, start East Nusa Penida Tour by visiting Goa Giri Putri, it has a very small entrance, just enough for one person. This cave has a length of about 310 meters and a height of approximately 10 meters. After that, we will take you to Teletubbies Hill. This hill consists of some green mounds of land like hills on the movie series children "Teletubbies". As far as the eye can see, you will be treated to a panorama of beautiful green grass. 01:45 pm we will drive you to Atuh Beach it is white sand covered, blue sea water and rocks towering high into the main dish this beach. Continue the East Nusa Penida Tour go to Raja Lima Nusa Penida is a treat of natural wonders consisting of cliff cliffs, white sand and small islands around it.